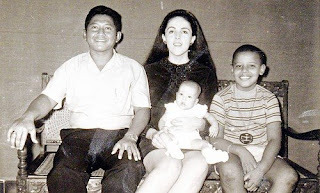 Barack Obama is pictured with his stepfather, Lolo Soetoro, his half-sister Maya Soetoro-Ng, and his mother in during his childhood in Indonesia. ** The public school: Paul Watson of The Los Angeles Times learned from Indonesians familiar with Obama when he lived in Jakarta that he “was registered by his family as a Muslim at both schools he attended.” Haroon Siddiqui of The Toronto Star visited the Jakarta public school Obama attended and found that “Three of his teachers have said he was enrolled as a Muslim.” Although Siddiqui cautions that “With the school records missing, eaten by bugs, one has to rely on people’s shifting memories,” he cites only one retired teacher, Tine Hahiyari, retracting her earlier certainty about Obama’s being registered as a Muslim. ** Mosque attendance: Obama’s half-sister recalled that the family attended the mosque “for big communal events.” Watson learned from childhood friends that “Obama sometimes went to Friday prayers at the local mosque.” Barker found that “Obama occasionally followed his stepfather to the mosque for Friday prayers.” One Indonesia friend, Zulfin Adi, states that Obama “was Muslim. He went to the mosque. I remember him wearing a sarong” (a garment associated with Muslims). Oh, and Barack has links to a radical Islamic-Marxist group and partied with a former PLO operative.